You may have noticed one of these signs near the cash register of your local Peet's coffee shop, or at other merchants, such as Radio Shack, or 7-Eleven. 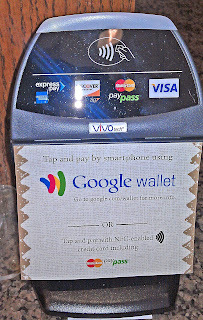 Google has been promoting the use of smartphones for mobile payments (M-commerce) with Google Wallet, which they have installed in handsets such as the Samsung Nexus S 4G on Sprint. 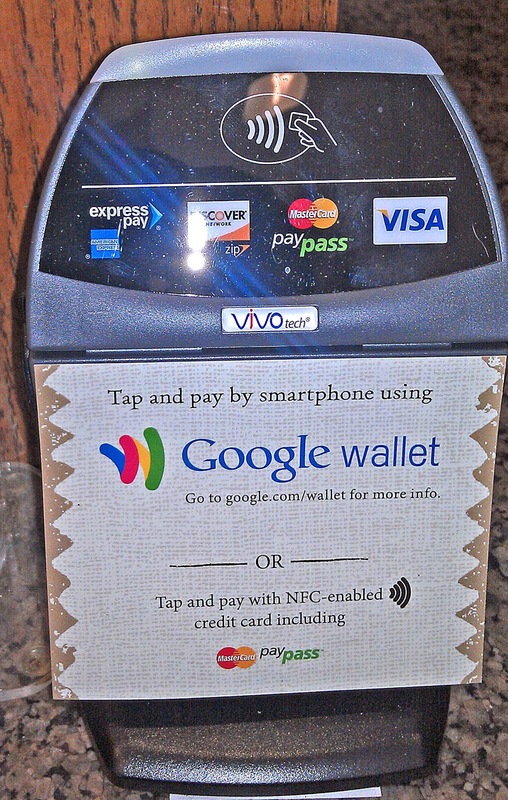 Smartphones with Near-Field Communications (NFC) technology for mobile payments, such as the Nexus S, are still relatively few, but a new Harris survey indicates that it may as well stay that way. A large majority of smartphone users in the U.S. show no interest in the use of such features for making financial transactions. In their online survey of 2,056 adults, Harris found that 63% of respondents are either "not at all comfortable", or simply "not comfortable", with using their smartphone as an admission ticket to movies, concerts or live performances. Only 24% of those surveyed said they would be comfortable with using a mobile app to store credit card information for making retail purchases. When asked to predict when mobile payments would supersede cash, 30% in Harris' survey said never, while 15% it would take 10 or more years. This may not come as good news to proponents in the U.S., but it has not deterred wireless infrastructure provider Ericsson from promoting its technology for M-commerce in other parts of the world, particularly in Africa. In a presentation at Mobile World Congress (MWC), Ericsson President and CEO Hans Vestberg spoke of the potential opportunities for M-commerce services to leverage the 1.6B cell phone users connected to mobile services through his company's networks. At MWC, Ericsson announced an alliance with Western Union to bring mobile payment capability to 2B people in the world that (the company says) lack access to financial services. In a analyst briefing today, Tomas Korseman, Head of Business Development and Strategy for M-Commerce at Ericsson Support Solutions, said that his company sees M-commerce set for major growth, predicting that U.S.$800B of mobile transactions would be processed globally by 2016. He did not say how many of those transactions, perhaps ironically denominated in U.S. dollars, would actually originate in this country. Korseman's statements did concur with Harris on the low penetration of mobile payments today, corresponding to 5% globally, the same as the 5% U.S. adoption in the Harris survey. Ericsson is targeting to grow the M-commerce market to 20% global adoption in the next 3 years. A key part of their strategy is to merge financial services with the services which carriers employ to facilitate purchase of airtime by their users, in order to transform cell phones into mobile wallets. 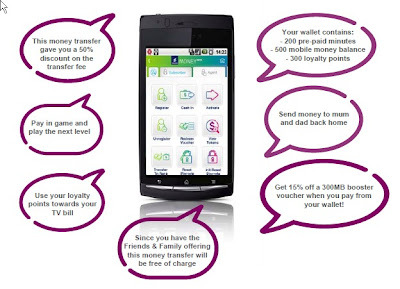 By working with companies such as Western Union, Ericsson sees the opportunity for carriers and financial services companies to cross-promote their products, incentivizing users by offering free SMS messages or airtime minutes, for example, in return for completing a mobile transaction. There are a number of groups vying for what they see as a profitable M-commerce market. The ISIS mobile wallet is a system launched through a joint venture of AT&T, T-Mobile and Verizon Wireless, that competes with Google Wallet. The VISA credit card company has their own mobile wallet, and at MWC they announced a collaboration with Intel to have it installed on that company's new smartphone reference platform. Ericsson is looking to profit by bridging the disparate M-commerce systems from wireless operators to service providers, with their M-commerce interconnect system, to provide a hub for the mobile payment ecosystem. 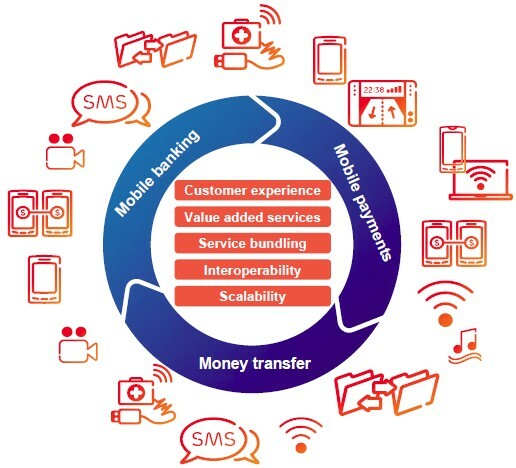 ericsson m-commerce Ericsson We see interconnection between the m-commerce ecosystem and the financial world are fast-tracking the next-generation of mobile financial services.